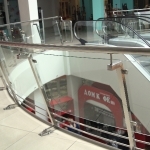 Bend triplex is a multilayer bend glass. 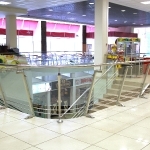 Bend triplex is very often used in design of interior of premises: partitions, guarding, stands, shop windows. Bend triplex is made with the help of frames. For each specific order, metal frames are made according to required dimensions and form. Glass is heated and bent in a furnace taking up the form of frames. After that two glasses are fastened with the help of film like in a flat triplex. 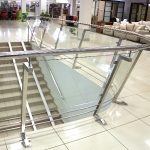 Such method of manufacture provides exact conformance of finished glass to an example or a template. Between glasses, at your order, special tinted films or fabrics of different colours, finishes or figures can be placed, that gives the product an unusual view.